The political fallout from the food security legislation may well prove to be nearly as dramatic as Indira Gandhi’s bank nationalization ploy of 1970 and the “garibi hatao” (banish poverty) campaign of the following year. In all these cases, the ostensible reason for the measures – food for the poor, the use of banks for public welfare and the articulation of an objective – is suspected to be a moralistic cover for the purpose of winning votes. Even then, since politics is as much about gestures as about achievements, few will deny the political significance of the food and land acquisition laws. Arguably, the latest initiatives may not be as successful as the earlier ones since the voters have become more perceptive – and cynical. At the same time, the cards played by Sonia Gandhi cannot but invest the Congress with greater confidence to face the electorate if only because of the effectiveness of the slogan that no one will now go to bed hungry and that the old, colonial land acquisition law has been scrapped. In addition, if Finance Minister P. Chidambaram’s 10-point plan to resuscitate the economy achieves a measure of success, then the curious combination of left-of-centre populism and right-of-centre economic policies will be a formidable one. It is another matter that by the time the effect of the food legislation is felt across the country, the general election will be very near. Similarly, no one knows how fiscally disastrous will be the gargantuan task of feeding nearly 800 million people with subsidized supplies. If the economy sinks under the burden of new subsidies – or the country has to import foodgrain – then it will not take time for the political expectations aroused by the initiative to evaporate. 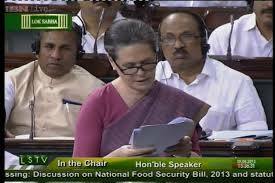 Evidently, the food security law is a high-risk gamble which can backfire badly on the Congress, and particularly on its sponsor, Sonia Gandhi. The prospects for the party will be worse if the industry gives a thumbs-down signal to the new policy on land because of the fear that it will inordinately delay the process of acquisition. At the moment, however, Sonia Gandhi’s “socialism” has enabled her to score several political points via these boom-or-bust ventures. For a start, she has re-established her total control over the party in contrast to the period in 2008 when Manmohan Singh had his way on the nuclear deal despite her reluctance. At that time, the high growth rates had also boosted the prime minister’s position. Now, however, it is just the opposite. As the rupee depreciates and the economy totters, the prime minister’s image has been at its darkest. In fact, as Sonia Gandhi delivered one of her rare speeches in the Lok Sabha on the food bill, Manmohan Singh seemed almost like a forlorn figure. But he partly resurrected his plummeting stock later in the week with a combative speech that held out hope for the economy and blasted the oppositon Bharatiya Janata Party (BJP) for blocking reforms by not allowing parliament to function repeatedly. A part of his loneliness all this while might have been because he was known to be unenthusiastic about the profligate move although he reportedly told a cabinet meeting that there was no option but to “bite the bullet”. However, it is worth noting that the eyes of the country are now on Chidambaram as he makes a last-ditch attempt to revive the economy, and not on Manmohan Singh. But it isn’t only the prime minister who is down and out. The BJP, too, has had to look on with dismay as its main political adversary pushed through the legislation on food which can be a game-changer, as the Congress believes. Yet, the BJP had no option but to keep silent as loud “ayes” from the Congress benches ensured the bill’s passage. Like the BJP, Narendra Modi, too, has taken a glancing blow since the party ignored its poster boy’s appeal to engage in delaying tactics by calling for a meeting of chief ministers to discuss the measure, especially its supposedly anti-federal aspects since the new law empowers the centre to direct the states on its implementation. Unlike Modi, the BJP understood that such filibustering will allow its critics to accuse it of being unsympathetic to the plight of the poor. On the land acquisition bill, too, it wasn’t possible for the BJP to be too critical when the alternative would have been to persist with the 1894 law. Since socialism – fake or not – has a halo of its own, it is difficult to negate its appeal. No one knows this better than the Congress with its long experience in pragmatism laced with cynicism. As long as Manmohanics kept the 250 million middle class happy because of the high “Sikh rate of growth”, as Congress MP Mani Shankar Aiyar once said, the party went along with neo-liberal policies. But once the economy began to descend towards the old, Hindu rate of growth, it is back to socialism again. In giving precedence to politics over economics, the Congress has chosen to live in the present with little thought for the future. The party is apparently not bothered overmuch if the economy sinks under the weight of food subsidies and domestic industrialists invest abroad because of the difficulty of buying land in India. By the time bad economics takes its political toll, the party hopes to be in power.